If you’ve had the opportunity to read any of my previous work (particularly my review of Jonathon Blow’s The Witness), you’ll be familiar of my undying fondness of his first indie hit, Braid. It’s difficult to pinpoint exactly what makes me so fond of Braid in the first place, but it’s accurate to say that the game’s approach to narrative and story is one of its greatest triumphs. Strong narratives in video games has been the Holy Grail or unicorn to many developers. It’s easy to come up with the basic mechanics that a game is comprised of, but to truly integrate the mechanics into a story, essentially having both gameplay and narrative playing off each other, is a difficult feat to achieve. Plenty of games have attempted to bridge this gap, and some succeed to various degrees. The aforementioned Braid ties its time manipulation mechanics into various aspects of one’s life, like forgiveness and hesitance. On the more mainstream side of the spectrum, Naughty Dog’s The Last of Us manages to build its combat and crafting mechanics around the apocalyptic nature of the world, lending a tremendous amount of weight to each shot you fire and each punch your throw. 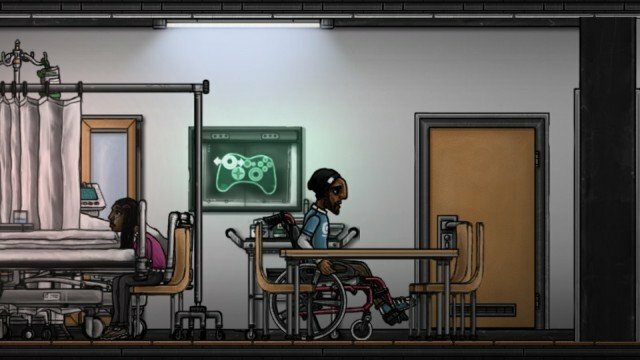 Enter In Between, a puzzle platformer from German developer Gentlymad. Drawing many parallels to Braid, In Between follows the story of an unnamed, middle-aged man, who is dealing with his impending death, brought on by a diagnosis of lung cancer. As he delves into his inner psyche, the protagonist reflects back on his life, contemplating life’s most difficult questions of purpose and meaning, while dealing with the five stages of grief. It’s a deeply personal tale, but one that is excellently told, and backed up by some well-produced narration. While I feel it is a bit depressing that this next tidbit of information is so noteworthy, I feel the need to mention the decision to include an protagonist of color, as this is a rarity in today’s landscape of video games. It’s not often that video games choose to tackle difficult subject matter, let alone the story of one’s impending death. Against all odds, In Between handles this with aplomb. This can be credited not only to the narration, but to the presentation as a whole. As you navigate around the environments, objects and people morph in and out of existence, and occasionally shatter, complete with a rather convincing sound effect. The hand-painted look of the game suits it well, and it meshes nicely with the soundtrack, which is a rather subdued effort that fits the game’s theme perfectly. During the scripted events and cutscenes, you also retain full control of the character, which is an effective tool that keeps the player immersed. 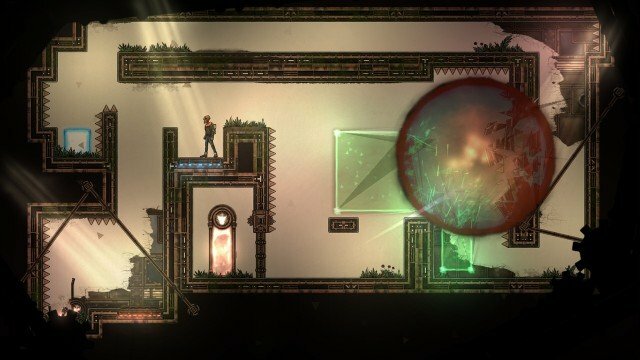 Moving through each level, which flashback to memories and events in the protagonist’s life, you’ll walk around the environment in an attempt to solve puzzles and reach an exit. The protagonist is not the most nimble, so you’ll rely on the manipulating gravity, the orientation of the world, and other physical properties to maneuver around each stage. The game draws elements from plenty of other well-known indie titles, though it does so without feeling derivative and cheap. If you want to look at it in a reductive sort of way, think Braid meets VVVVVV, with a little And Yet It Moves thrown in for good measure. Over time, the game mixes in other mechanics, like crates and switches that must be manipulated and moved in order to progress. Without revealing too much, the different aspects of grief and fear that accompany one’s impending death begin to creep their way in as well. One example is a rather ominous black wave of complete darkness, which can only be held at bay by facing it directly. This sort of limitation lends a more strategic and thoughtful approach to the game, influencing and shaping how you maneuver around a given level. For the most part, In Between tries to shy away from relying on precise timing and reflex focused play in order to progress, though there are a few segments which may prove a little difficult depending on your skill level. Coupled with a sparse amount of checkpoints, some might find themselves replaying sections more often than one would hope for, but the few difficulty spikes present never completely derail the game. Puzzle platformers are a dime-a-dozen these days, but In Between is a hidden gem that you shouldn’t shy away from. The grim subject matter and mature themes might not make for the most exciting game, but they do make for a deeply personal and engrossing one.